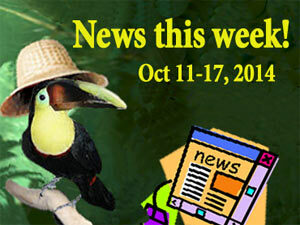 Pet and Animal Roundup, What’s New this Week? Latest web chatter around the animal world; cute, funny, inspirational, unbelievable, smart, and dumb! To help you stay up to date with what’s happening around the animal world on social media and the news, here are some of the pet and animal items that caught our attention during the week of October 11-17, 2014. A lazy hamster… or just plain smart! When is a dragon… not a dragon? Keeping a rare dog breed alive, nomad style! Animal people, they’re not who you think they are! Pet Words of Wisdom – Animal people make the day! How about a swim in a shark filled aquarium? Snakes in a techie world! The dream job of every cat! Who’d a thought, marine fish liking oil rigs! Misguided snake eats the mouse trap instead of the mouse! Just how many fish can a fisherman eat? Pets are so cute and sweet sometimes and can be our good company.